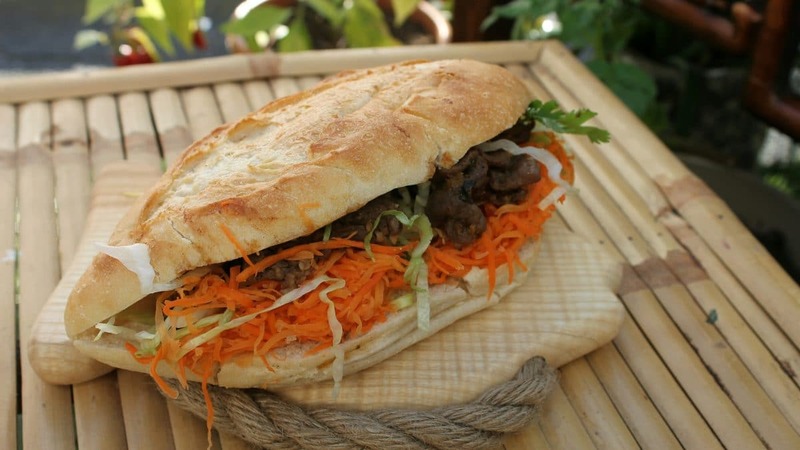 The banh mi is a must eat while you are in Vietnam – the combination of meat, sauce, vegetables, and herbs is really tasty. You can find them on nearly every street corner in food trucks in the city center, and in restaurants. Banh mi means bread, or Vietnamese sandwich, and it was introduced by the French colonialists in the late 19th century. When it was introduced to Vietnam, French baguettes were filled with Western toppings which were often too expensive for the locals. After some time, the Vietnamese started to use French baguettes with their own ingredients in different combinations of sizes and flavors. Afterwards, the banh mi was affordable for everyone and is a popular sandwich to eat nowadays. The banh mi is filled with pâté, pork, sausage, carrots, pickles, chili sauce, soy sauce, parsley, coriander and sauce. When ordering at a food truck, the person behind the counter will place the French baguette on the barbecue and grill it for a moment. The toppings will be served inside the French baguette with the sauce and herbs on top. Banh mi is a popular street food, eaten from early morning until late evening. You can eat it with your hands. There are also vegetarian versions, more commonly found in restaurants. It is a product of French colonialism with Vietnamese influences. This Vietnamese speciality is also popular in New York, London and Paris. Have a look at this video about banh mi in Saigon. Soraya loves to travel and is always up for an adventure. One of the best things she loves about traveling is meeting new people and trying new things. With her camera she captures the moment and shares her travel stories.